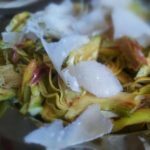 Fresh artichoke salad: We had spent the morning with Nedda’s husband Franco, walking a little way along the Path of the Gods which winds around the Amalfi coast in Agerola, and had worked up an appetite. Which was just as well because aside from this fresh artichoke salad antipasto offering, Nedda was also preparing other wonderful things for the other 2 or 3 courses to come. 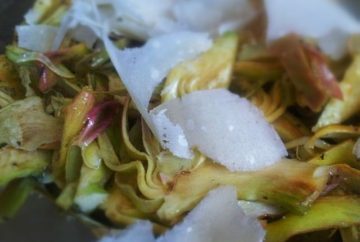 To recreate your dish of raw artichoke antipasto, you’ll need a few of the long artichokes, not the larger, round globe artichokes. Calculate 1 to 2 per person. Freshly shaved Provolone – Nedda uses Provolone del Monaco D.O.P. 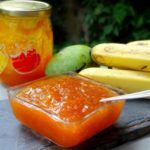 Place the lid on the jar and give the marinade a good shake. 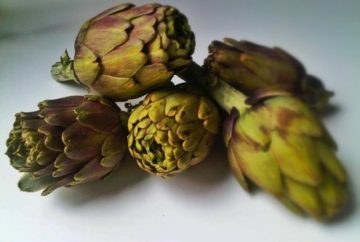 Once you’ve prepared all of your artichokes and have them sitting in lemon water, drain them as dry as possible. Use a salad spinner if you have one. Slice the artichokes lengthwise, as thinly as you possibly can. Toss the slices of artichoke in the marinate making sure to coat all of them all over. 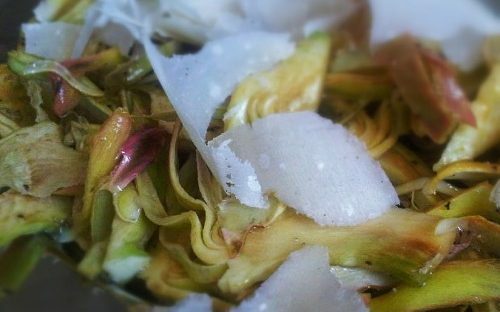 Serve your artichokes with freshly shaved Provolone cheese.